My first glimpse of Rage 2's driving began at high speed. Driving the Phoenix, a customizable batmobile serving as my main vehicle, I roared down the open road in pursuit of an enemy convoy. The combat was surprisingly complex. A tanker was guarded by a handful of escorts, some of which had energy shields. I would have to wait until the shield dropped before opening up on them with the machine guns attached to my hood. The tanker itself had weak spots as well, and I would similarly have to wait for them to appear to be able to do any appreciable damage. All of this was happening while I tried to keep the pedal down on a twisting, turning dirt road. Avalanche Studios decided to take this approach to car combat for a specific reason, director Magnus Nedfors told me back at E3 2018. "A lesson we learned from other games is to avoid what we call a 'parking war.' In a lot of car combat games you're circling people, jerking back and forth, struggling to maneuver the car. We want to keep the combat going down a road to keep the speed up. We've come up with a lot of scenarios where you chase the enemies, they have goals themselves, and you're not stuck going backward. It gives the combat high speed forward momentum. That's the core of the car combat." Avalanche Studios, of course, is no stranger to car combat. Its portfolio includes Just Cause and Mad Max, both of which involve driving in some fashion. It was Mad Max that caught the attention of id Software when it was looking to revive Rage, which was due in no small part to how much it resembled George Miller's post-apocalyptic classic. Avalanche is taking on a series that has a somewhat complicated relationship with vehicles. The driving in the original Rage wasn't bad, per se, but many players felt that it took away emphasis from the more traditional FPS combat that id was known for. Rage was a first-person shooter that was sort of frankensteined into a directed sandbox game, and the vehicle segments exemplified that. It's perhaps for that reason that id and Avalanche have largely avoided talking about vehicle combat to this point. Driving has only been revealed in dribs and drabs, with an extended gameplay trailer from QuakeCon providing the longest look at the car combat until recently. Bethesda's recent Rage 2 event was my first opportunity to actually try the driving for myself. Nevertheless, driving seems to be a pretty significant part of the Rage 2 experience. id Software studio director Tim Willits won't say how many vehicles there are total ("More than a dozen and less than a hundred," he says), but there are definitely a lot of them. They include bandit cars, motorcycles, race cars, and flying vehicles like a gyrocopter. You can drive a tank. There's a boat, apparently, which begs the question of just how large Rage 2's sandbox actually is. I ask Willits about his favorite car. "The monster truck by far," he says, smiling. "You can drive over anything, you have jets coming out the back of it, and well, it's kind of fun to drive in a monster truck, isn't it?" I never get to try the monster truck myself, but I do manage to jump into at least a few vehicles scattered around the world. When Rage 2 was first announced, the marketing made a big point of saying that you could drive anything you could see. Sure enough, I see a half-dozen cars parked in various bandit camps, and when I'm not blowing them up, I'm making off with them. In the finished version of Rage 2, it will be possible to stash these cars in a garage to access later. The garage will also be where you get to upgrade the Phoenix's weapons, which include machine guns, shields, and mortars. You will also be able to tinker with its shields and engine. 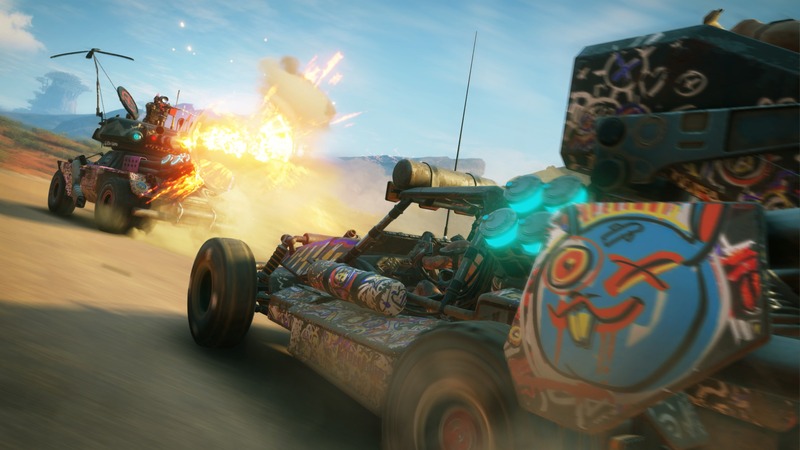 Depending on how much you want to engage with Rage 2's driving, you will be able to attack convoys, steal cars for your garage, or race in the wasteland. But if you'd rather just focus on getting from Point A to Point B, you can stick to the Phoenix. 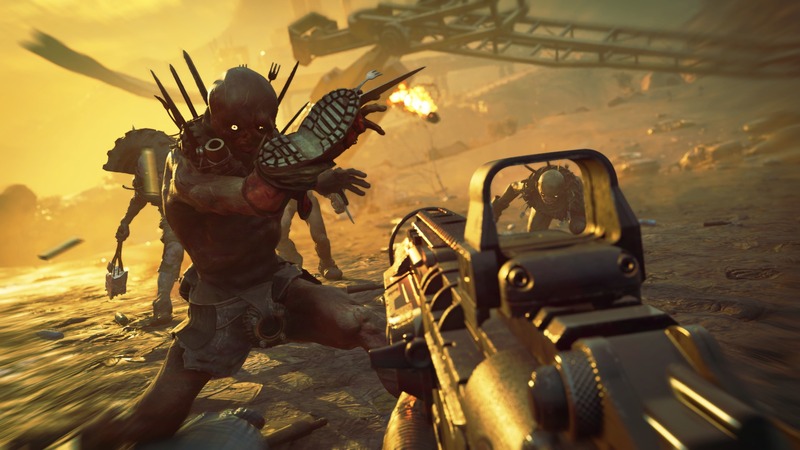 Rage 2 is pretty much leaving it up to players to decide what they want to do. I'll admit that I'm glad the driving is optional. Because right now, it's probably the roughest part of Rage 2. The Phoenix feels stiff while at the same time lacking a sense of weight, and many of the secondary cars drive even worse. Asked about the handling, Willits says, "We try to do more of an arcadey, non-realistic physics so you can be a little more maneuverable." Nedfors talks about the goal being to keep Rage 2's driving controls simple. "The most important thing is ability for the player to feel in control of the vehicle, at the same time take in all combat information; to simplify the control scheme, because there's so much going on." I get the clearest sense of how Rage 2 is supposed to feel in the convoy attack sequence. As I swerve left and right in hot pursuit of my quarry, I find myself fighting to maintain control of the Phoenix as it races along the narrow dirt road. Here it feels like a wild action movie. But outside of the chase sequence, the vehicle combat feels considerably worse. Fighting enemies on foot is particularly strange. Ordinarily, fighting enemies in a car is fun, as you can just flatten them (see: literally every vehicle game from Grand Theft Auto to Battlefield). But in Rage 2, the level design often deliberately blocks you from reaching enemies who crouch behind walls and snipe until you finally climb out of your car and attack on foot. True, you can blast them from afar with your car's weapons, but neither your machine guns or your missiles do much damage to them. What's more, while your guns will automatically track enemy vehicles, they won't track enemies on foot. "We originally let the guns lock on to people, but they would jump around too much," Willits explains. "You would be driving and the guns would jump, which made it kind of distracting. So we've been working on that." These are ultimately the moments that really drive home Rage 2's split personality. Once again, Rage 2 primarily shines when you're battling on foot, as it's here that you get to play around with its wacky physics-based powers and guns. The vehicles, for as much as they figure into the gameplay, still feel like a secondary concern. The good news is that we're still a few months out from release, so there's plenty of time to tune up the driving and combat. As has been pointed out many times, Avalanche has a lot of experience with driving mechanics, and I expect it to get it right. 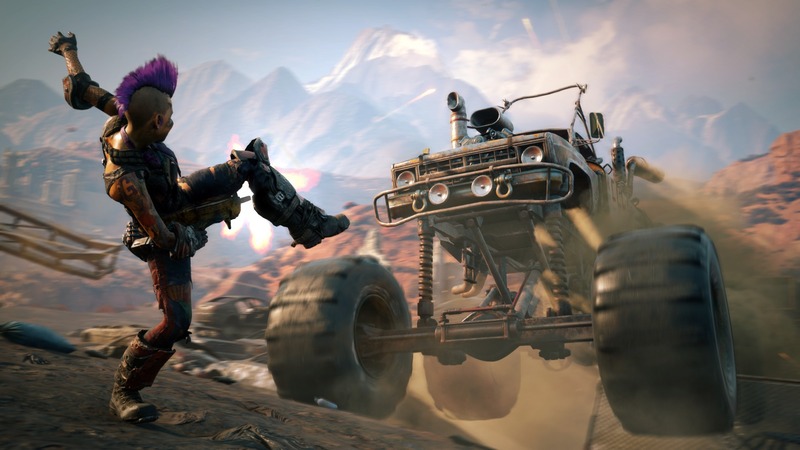 But if you're expecting Rage 2's driving to be anywhere near as good as its shooting, I expect you'll ultimately be disappointed. Rage 2 releases on May 14. Tagged with Action,	Avalanche Studios,	Bethesda Softworks,	Feature,	FPS,	id Software,	PC,	PlayStation 4,	Xbox One. Also, cliffs. The cliffs are out to kill you stone dead.